Mapmaker, mapmaker, make me a map! I'm glad I don't know any more of the lyrics to that song because they probably wouldn't make any sense as I thread my way through the woods, clearing my way with my Felco pruners. On New Years Eve I went for a walk with my aunt to look for the roads I mapped back in 2009, my last small year. Her perception of the area between the roads on the map I printed for her didn't match what I showed. 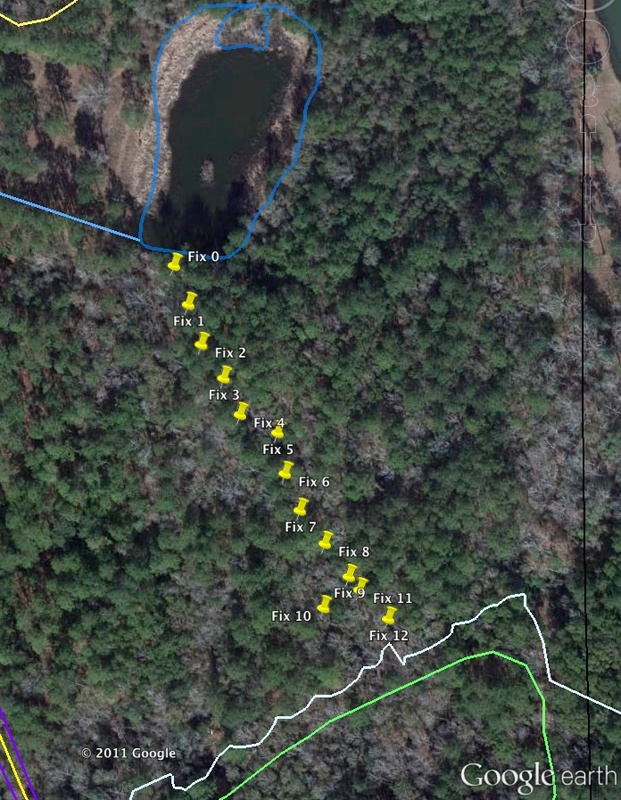 She allowed that I was right after all, but thought the map would be easier for her to understand if it showed the creeks as well. Since it's primarily a tool to control fire, a creek would be a good thing to have on there. If they have water in them they count as a fire break. But they don't have water in them now, so all the better to map them walking right inside the creek bed. Back in 2009 I borrowed a Garmin GPS with a USB port from a friend. I recorded tracks with it while I rode around on my mountain bike. 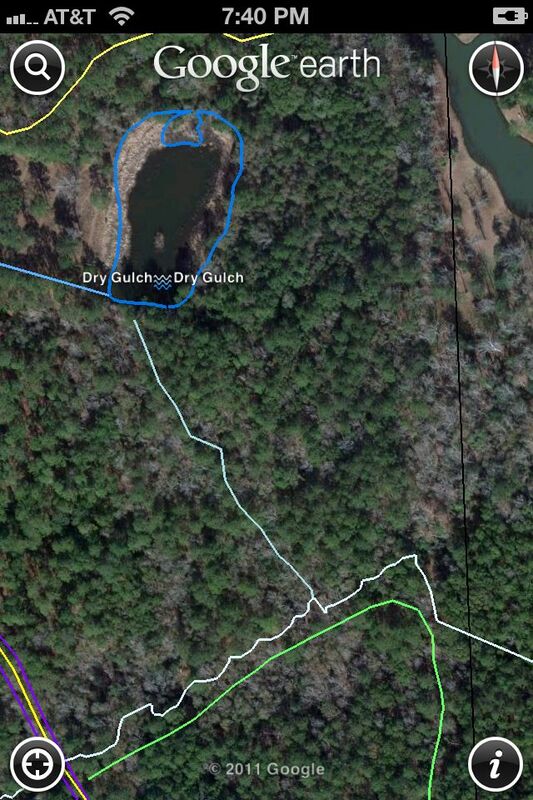 Then I plugged it into the iMac and imported the tracks directly into Google Earth. 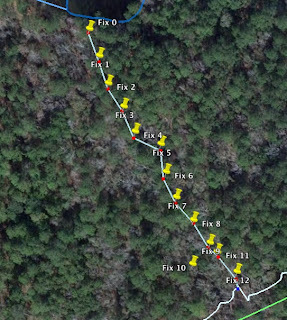 But now that I have an iPhone with accurate GPS and the Google Earth app I should be able to add the creeks with my own hardware. 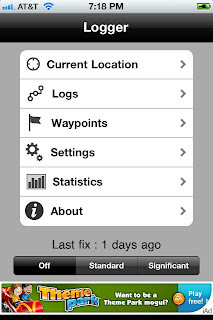 After a tedious and frustrating search on the App Store I settled on a free app with zero reviews, Logger from Skiroute 16. I think the developer is in the UK. They seem to be the most enigmatic company I've ever seen on the internet. They have none of the obnoxious marketing hyperbole that is so offputting to me. Near as I can tell it's a rock climber who decided to write related software. I love rock climbers. Sold. I wish I could pay something and not have ads, but it's not a big deal. 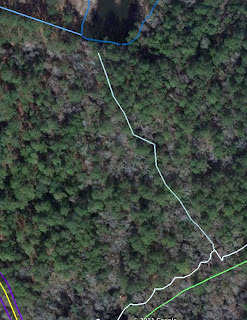 Sunday was too hot to pull briars out of trees, almost 80°F, so I set out to map a creek. 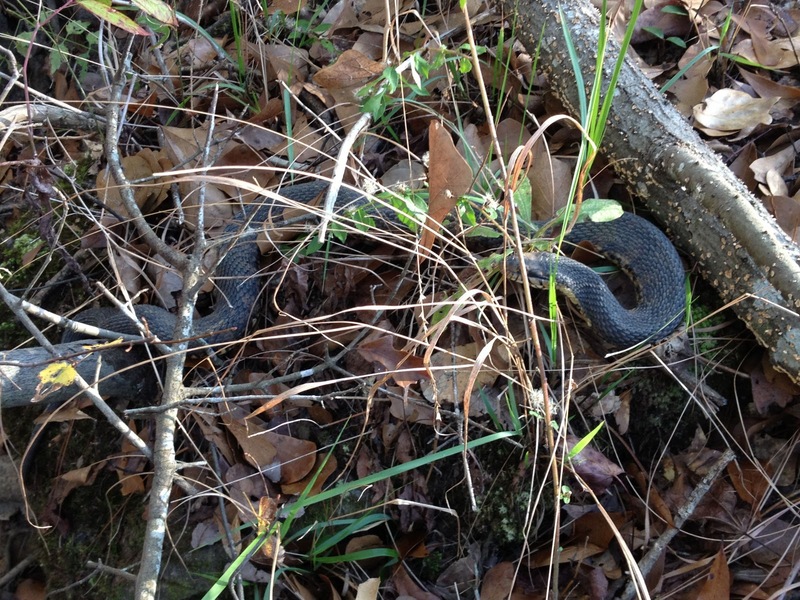 I was a bit nervous I would encounter a cottonmouth moccasin on such a warm day. Even though the creek was dry where were they gonna go? Instead I saw one of these. open their mouth at you. And I don't get this close to them. This is taken with my iPhone 4s, no zoom. 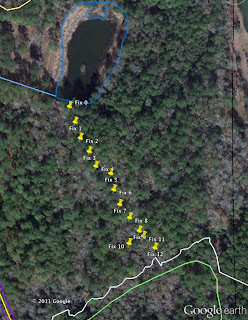 I'm going to explain the process of making your own trail on Google Earth now because I had to figure it out all over again since I didn't write it down in 2009. Also I'm going to review the related iPhone Apps. I can think of two people who might care. The beautiful thing about the internet is you can stop reading at any time. Here's the Logger App home screen. Very straightforward. Click on Logs and you can see I've created three already. Two I used to automatically store tracks and the third one I started to keep up with locations of Japanese Climbing Fern around our place so we can go there in the spring and spray it with Roundup. I'm just doing one waypoint for each location. 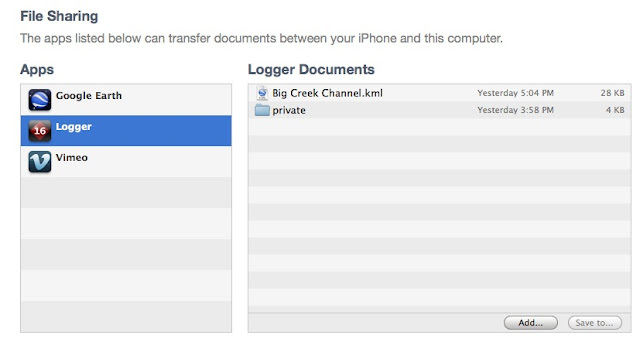 When you select just one of the logs you see Active, which is how you set which one you add Fixes to when you go from off to logging. (Fixes are like waypoints, the lite version.) This is not the active log. Touch Active and it gets a check mark by it. You can change the units to Imperial but I'm using metric because President Carter deserves a lot more respect than he gets. If you touch that icon at the bottom that is very obviously a folded map to me (good job icon designer) it shows you the logged points in Google Maps. Brilliant. 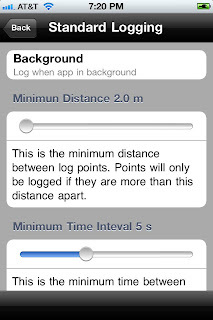 You can adjust the parameters for how often to save a point. I set it to wider spacing when I did this kind of straight creek. I reduced it for the more meandering one I did next, just to see which I like better. 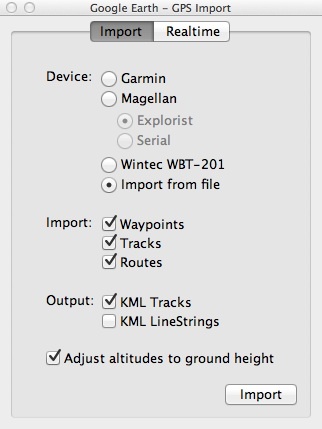 Now to get the track out of the Logger App and into Google Earth you can use iTunes. Under the Apps tab when you have your iPhone selected there's a File Sharing section. 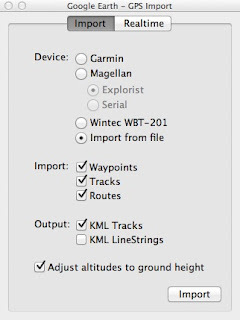 When you Export KML from the Logger app it shows up right away in iTunes. Highlight it and Save to... your hard drive. Easy! Then how to get it in Google Earth? 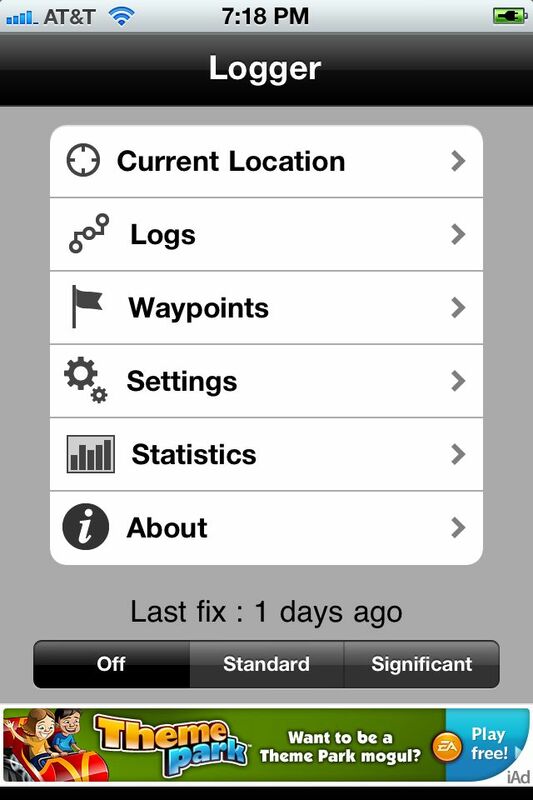 Well under the Tools menu there's a GPS Import option. This showed me grayed out files. No good. 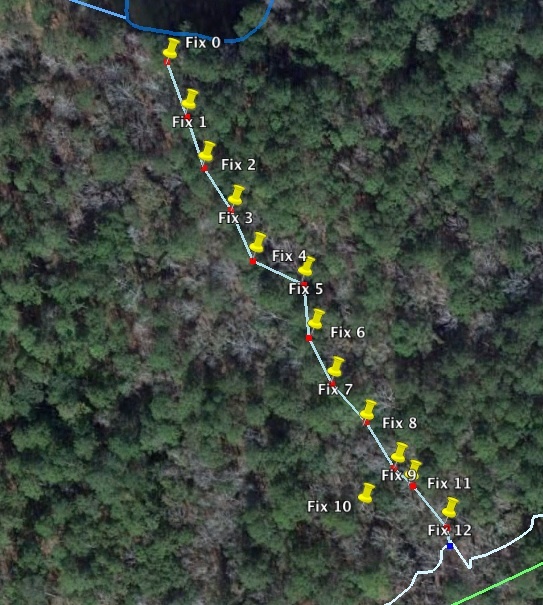 Google Earth turns out to be the weak link in this process, not Logger. The work around is simple though. From the finder, drag and drop the .kml file onto the Google Earth icon on the dock. It will have the same icon as Google Earth so it's kind of a no brainer. What you'll get is a series of numbered pins on the aerial photo. In the left hand menu you'll see them organized in folders in Temporary Places. Drag this folder from Temporary Places to My Places. Rename it to something logical. (Right click or two finger tap or command click or use the menu at the top to get the Rename option.) Now if you want a nice path instead of these infuriating pins with the labels that are impossible to associate with the right one then you have to do a bit of manual work. I cannot find any better way to do this and it pretty severely pisses me off. 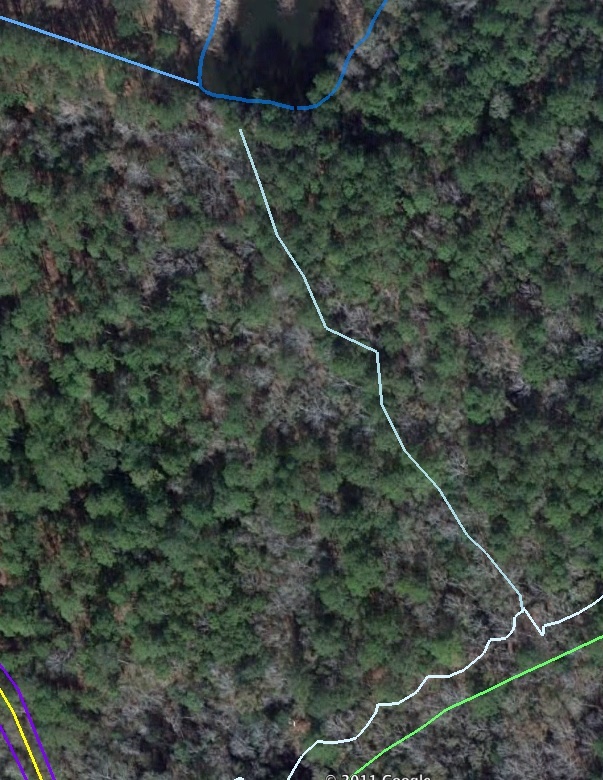 Probably why I haven't messed with Google Earth much since 2009. Anyway, here's what you have to do. Right click on the folder with all the Fixes in it. Add a Path. Name it and then open Get Info (right click again). For some insane reason this is how you make this stuff editable. 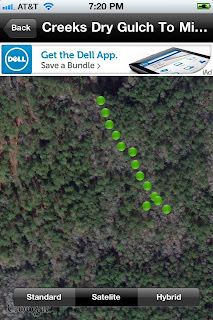 Line the crosshairs up with the pins and click on them. It doesn't have to be perfect, it defaults to snapping to the point. Do them all in order and you get a line connecting them. This is now a path, which has a Measure tab, which is handy because it will tell you how far it is from beginning to end. Click OK in the Get Info window to stop editing the path. If you don't close the editor the next time you do anything you'll create a giant string of points. I hit Delete repeatedly to get rid of them. I forget to click OK often. Now there are several ways to get rid of the pins. You can uncheck the box next to their name in the left hand menu. That hides them but you can go back and look at the date and time you saved them and stuff like that. I don't need that info here so I just select them from the menu and delete them. I did this screen shot then realized you have to start with Fix 0 so it automatically goes to the next one so you can do them rapidly with delete/enter/delete/enter/delete/enter. (I had 142 on the other creek so it was pertinent.) I can find no way to uncheck them all at once. Alternatively you can move that path up a level or two and delete or uncheck that whole folder. I did that, only later after I'd already done it manually. So that was inefficient. When you're done deleting you have a nice new path. Now go to the File Menu and save My Places. This saves it to your computer so it's there next time you open it. 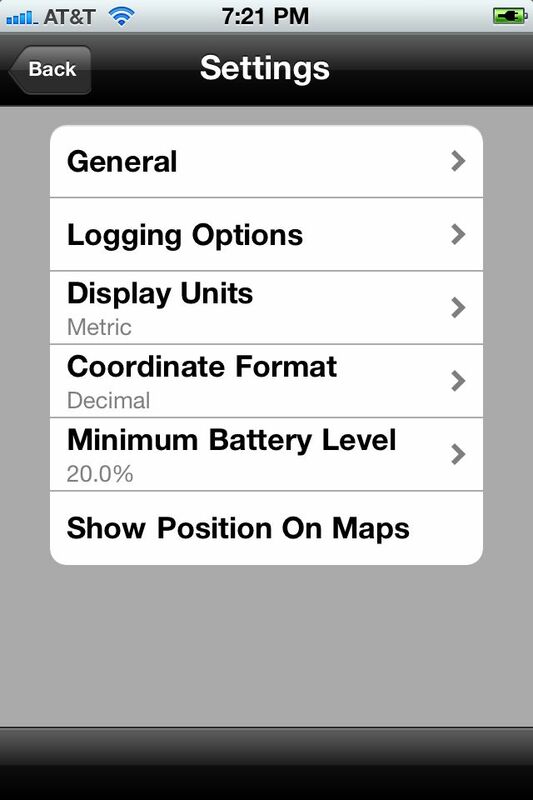 Next you get to mess around with Save Place As to export a .kmz file that you can get back on your phone. I had to fool around with this a while to get it to do all the stuff in that particular folder of My Places. I had to move the paths up a level and delete the extra folders. 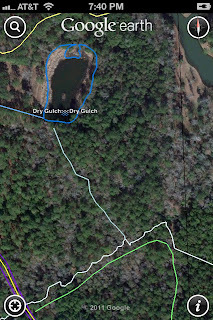 I did finally get a file that looked right when I imported it into My Maps on Google Maps. In iTunes you can apparently share files with the Google Earth iPhone app. I put the .kmz file in there but there was no way in the app to access it. I tried it again later and got an error that the required disk cannot be found. It works fine in Skiroute16 Logger. So fail on Google I guess. Here's the workaround for THAT. You have a My Maps set up in Google Maps, right? Well go to Google Maps on your browser and go to My Maps and Create Map. Select the import file option. Browse to the .kmz file you saved from Google Earth on your computer. Create that map! I set mine to private so nobody can see it. Watch out though because the default is public. Now go to the Google Earth app on your phone and touch the little i in the bottom right corner. There's a section where you can log into your Google Maps account. Just use your general Google user information. Then you can select the map you just created by name. In the field you could use it interactively with your location displayed in real time. I'm not sure why your personal My Maps aren't available in the Maps app on the iPhone, but here's how you can get to them. And that's all there is to it! It will make you cuss, though, I'm warning you. Google earth is a twitchy, irritating program and you have to use your arrow keys to pan because the touch pad seems to just make it tilt and zoom way more than you want it to. Stop TILTING! What do you think's going to happen, I'll be able to see under the trees? It's like when I was a little girl and we were allowed to watch TV on Sunday night after supper. But all that was on TV in the '70s was HeeHaw and The Wonderful World of Disney. When the cloggers in short skirts did their dance number on HeeHaw my brother would go right up to the TV and look up at it from below. Say, with 3D televisions imagine the crushing disillusionment for all the little perverts in well-to-do households who try that.... So sad. Although I'm undoubtedly not one of the two people who would care about this, it's right up my geography alley. But what a pain in the patootie! I'd never have the patience to go through those steps (or to figure them out). Again, you get creds for perseverance and ingenuity. By the way, Motion X GPS goes on sale from time to time. I got it when it was free about two years ago. 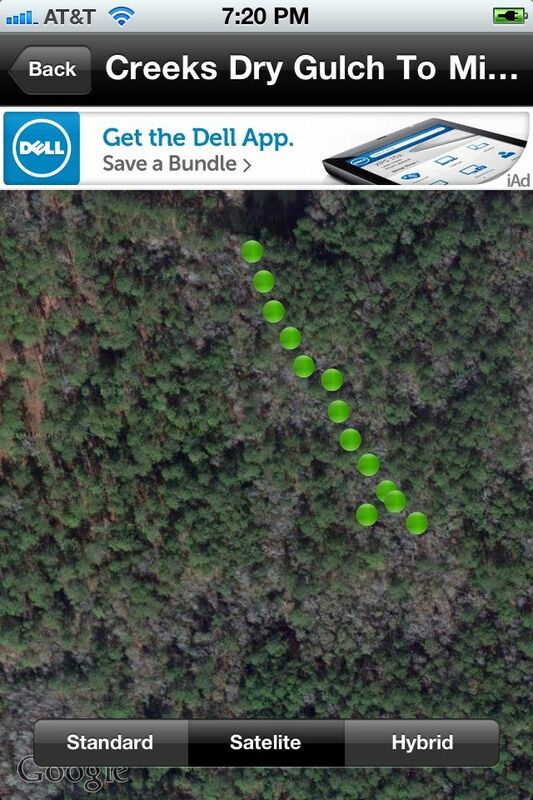 Another nifty GPS app. It also works with Google Maps and Google Earth. Another (not free) way to get local topographic maps is Trail Maps by National Geographic. 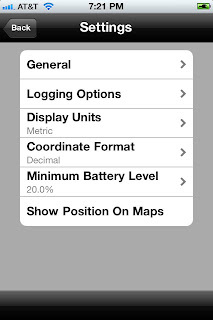 $2.99, but you can download and save local topo maps of most anyplace to your iPhone or iPad. I have a few saved to the iPad. Once they're saved, they don't require a connection to a network for use. Of course without a connection, you're S.O.L. for using it like a GPS! But they work like regular topo maps then. I could load the PDF of the my local quadrangle topo map to my iPhone and look at it with iBook. I pretty much have that one memorized anyway though. 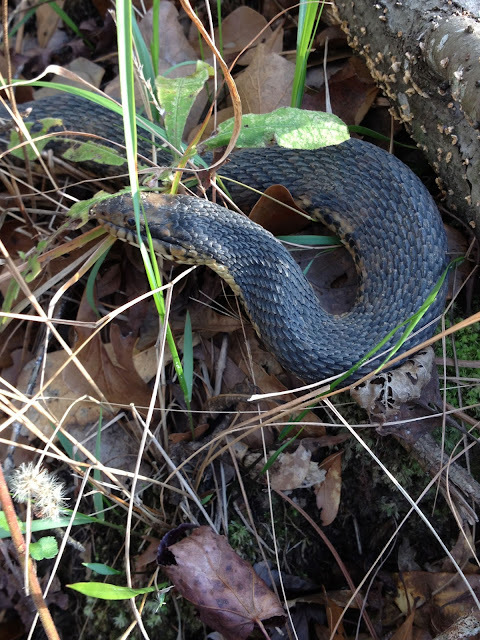 If I decide to go anywhere outside my own property I will get the National Geographic app. My problem now is I'm running out of memory on my phone! I accidentally got the 16GB instead of the 32GB version when I upgraded to the 4S. So I'm kind of conservative on what apps I load. This Google Earth map I made ended up printed with my black and white laser printer. It didn't look good. My aunt traced it with colored pens to make a much simpler better looking one that she uses when she's planning where to go on her tractor. She'll probably just look at these new lines on my phone and draw them freehand on her map.